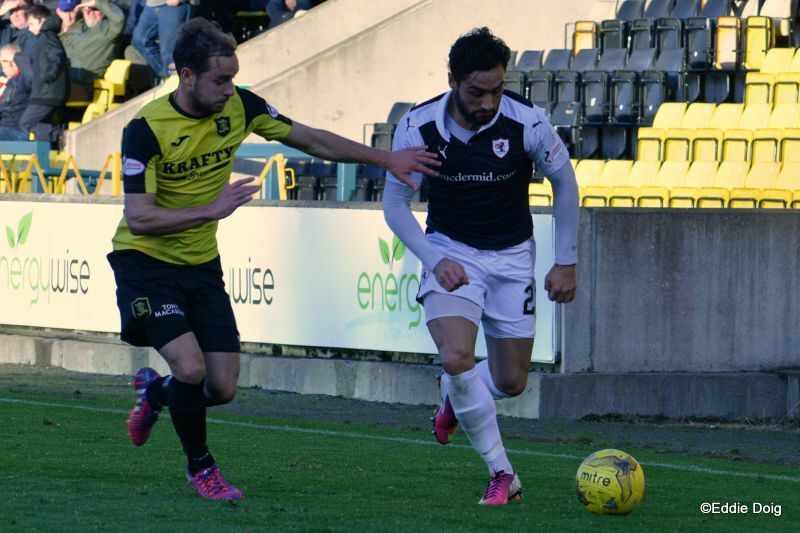 The Tony Macaroni Arena served up a less than palatable result for the Rovers today in Livingston. 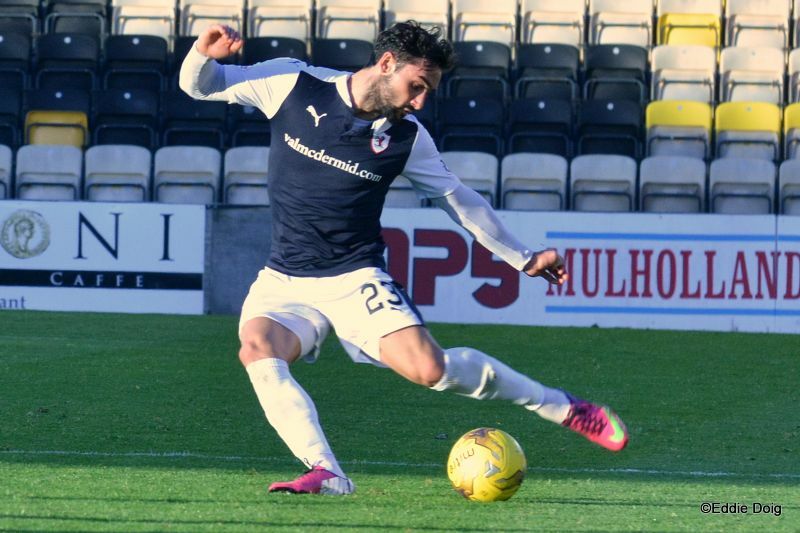 The new name coming after the West Lothian side sealed a deal with a chain of Italian eateries. The starting eleven was tweaked with Matthews and Craigen being replaced by McCord and Anderson. 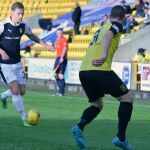 Ross Callachan made a welcome return to the bench after injury and Craig Wighton was beside him despite being stretchered off last Saturday. 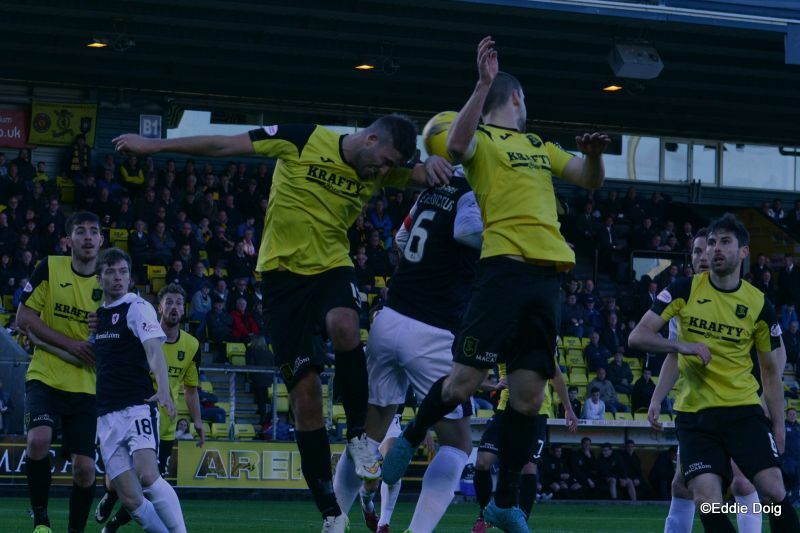 A large Rovers support hoped that the match would leave them talking about play rather than the officials after the Hibs game. 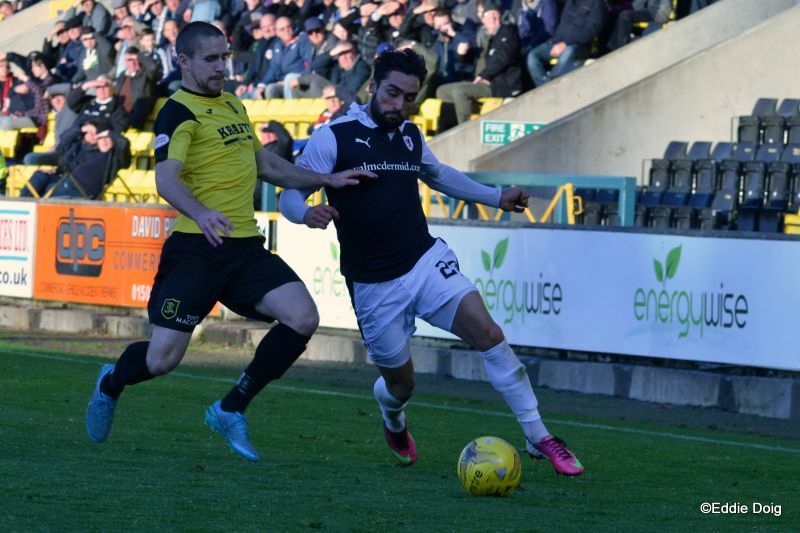 The hosts were looking to build on their win at Queen of the South. The tables were set for what all hoped would be an entertaining match. 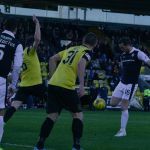 The Rovers started sloppily but Cuthbert rose to claim an early free kick easily before Buchanan hit a first time shot past a post. 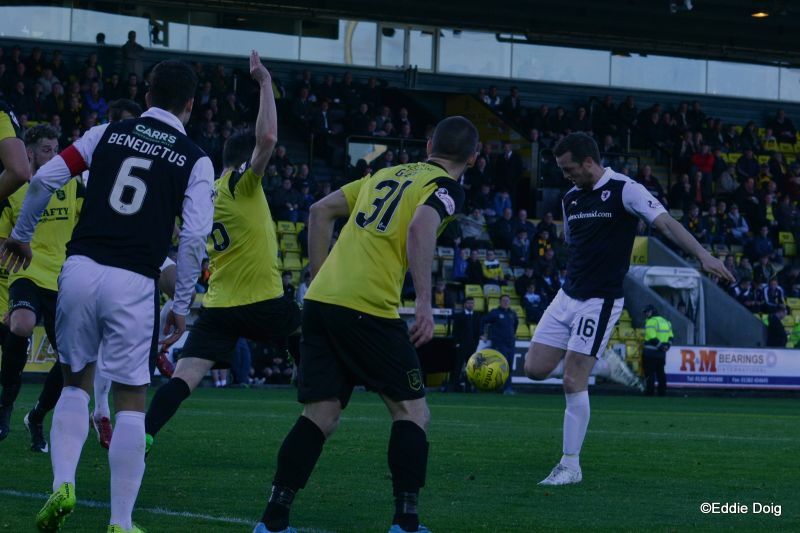 McKeown pushed a low pass towards Stewart in the box but the ball was shepherded out. 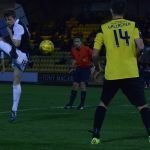 In the sixth minute the hosts served up an opener, a deep cross from the far side dropped at the near post where the big front man White and Cuthbert rose and the striker bundled it home. As some visiting fans called for a foul on the man with the gloves the hosts celebrated. 1:0. The Rovers appeared to have been caught cold. 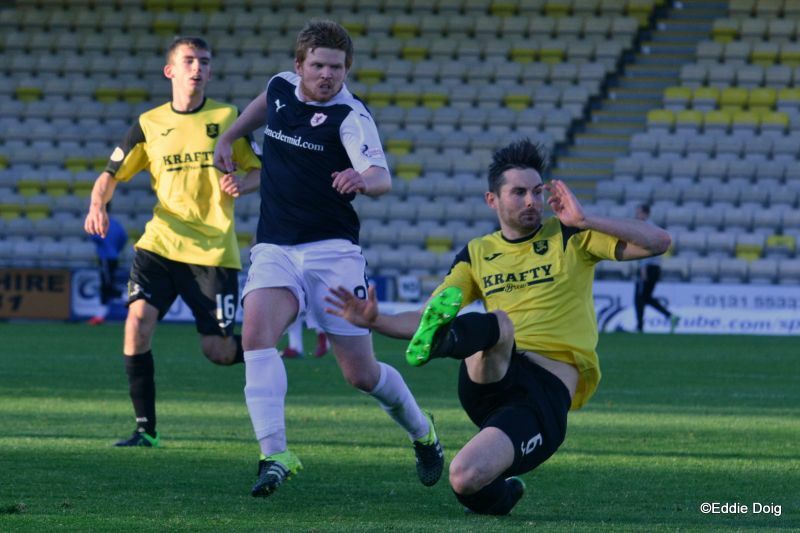 McKeown then did well to prevent Buchanan capitalising on a pass from White. 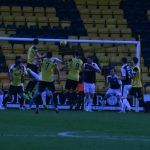 In only the 18th minute the home side were motioned at by the Referee for being more than ponderous with a throw in – slow service they continued much of the first half – perhaps trying to break up the flow of the game. 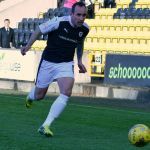 In the 19th minute a long throw into the box saw John Daly unceremoniously bundled off the ball… A minute later the Rovers created their best chance, a flap by the home keeper saw the ball break to Anderson who deftly laid it on a plate for Mark Stewart about six yards out. The Rovers number 9 blasted it high and wide when it looked easier to score. No doubt relieved the hosts forced a corner which they didn’t capitalise on. McKeown was keener than some to get a piece a the action and a long throw saw McCord play it wide to the advancing Thomson who crossed. Anderson headed across goal from tight to the post but it whipped across goal untouched. In the 33rd minute the referee took time out to issue a home man with a warning for time wasting. 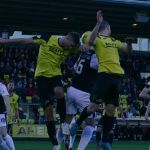 As the home side continued to have the better of the play White was spoken to having ducked out of a header which meant Thomson fell heavily to the turf. 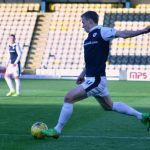 Despite treatment the Rovers Captain had to be withdrawn and Craig Wighton came on as the home support wondered what difference can a loanee make. 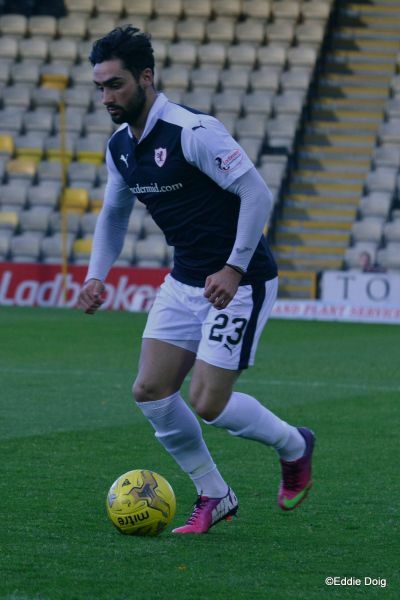 The Raith fans however know the youngster has done well so far. 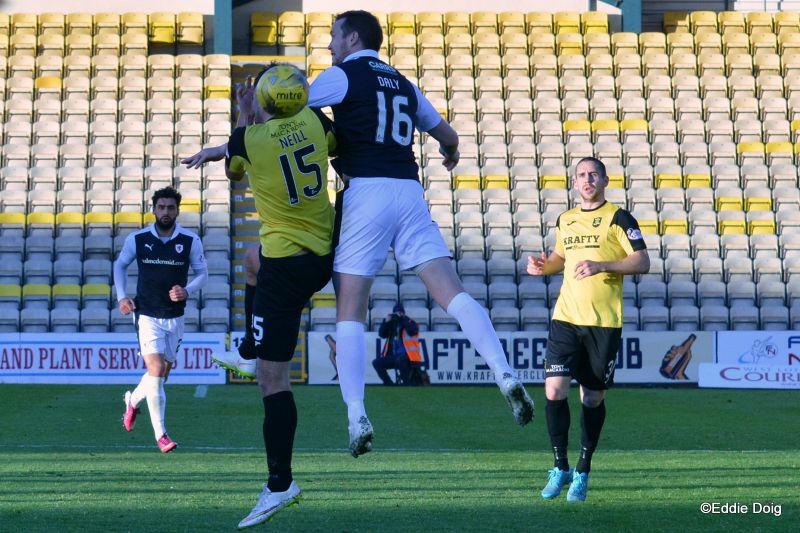 The ex-works team number 15 almost ended up in hot water but got only a warning for a foul. 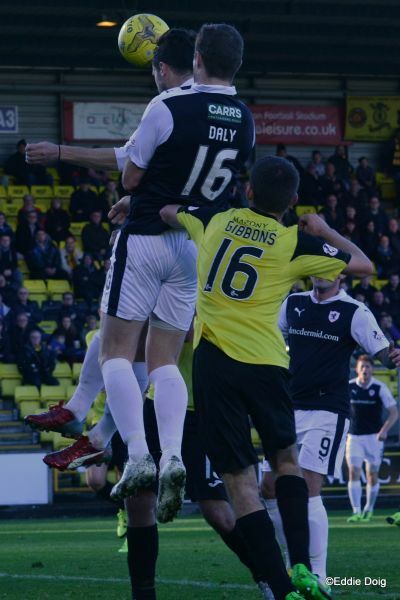 As time wound down to the half a hefty shove on Daly in the box was ignored before Wighton’s low effort through a forest of legs in the box was stabbed away by the quick reflexes of the home keeper. 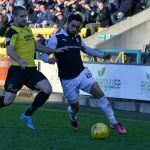 Grant Anderson who’d slotted in at right back remained there with Wighton on the left and Stewart the right as the Rovers started brighter. 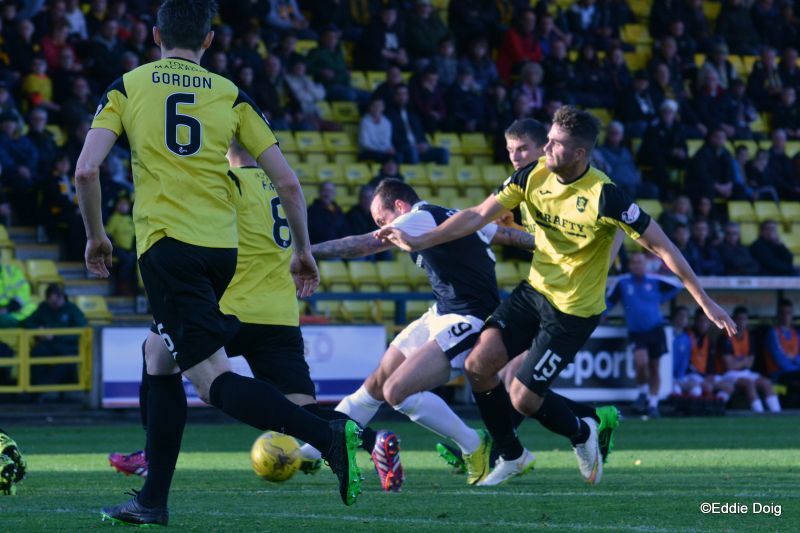 On the side line in front of the Raith support Stewart skipped away from a defender and was fouled only for a throw in to be given. The near linesman was proving not too popular with the travelling fans. White was penalised again and from the free kick Benedictus headed over. Three minutes later White fouled again. Anderson’s cross shot was claimed at the second attempt. Longridge fired wide as the home support rose thinking it was closer from their angle. 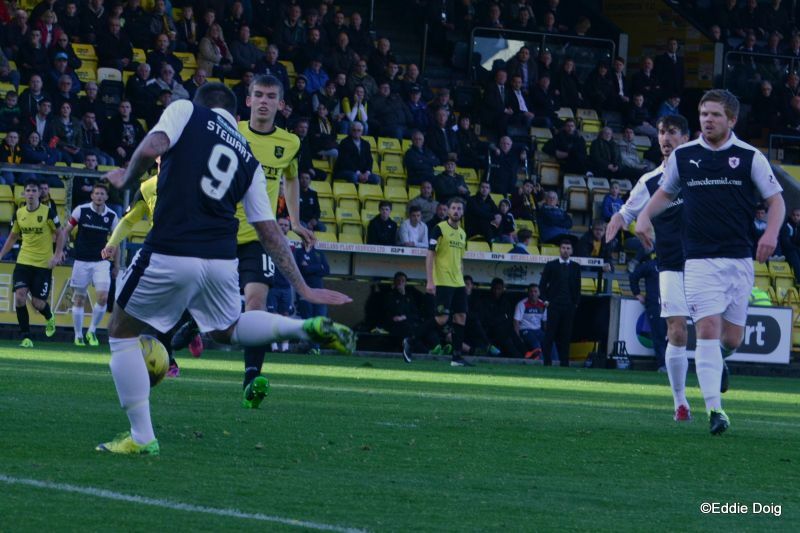 Then Stewart got on the end of a Daly flick shooting first time just over. 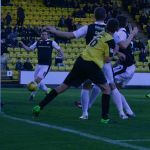 Livingston tried to take advantage of a misplaced pass then Faris was booked for blocking Wighton. 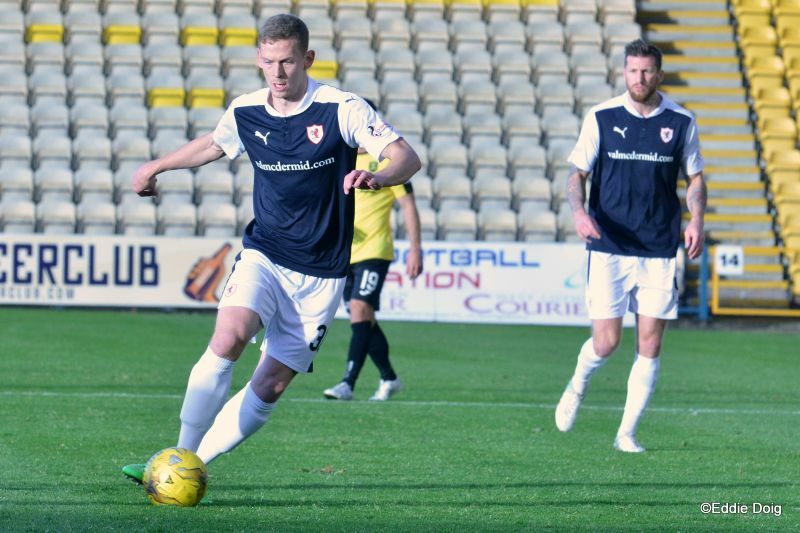 Megginson had warmed up and replaced McCord just before the hour. 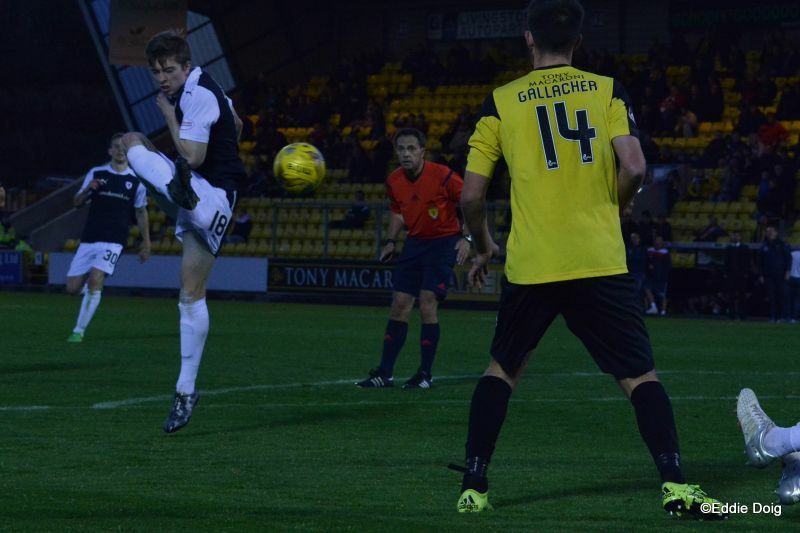 Before he could make an impact the home side doubled their lead Gallagher rising to head a corner home unchallenged. 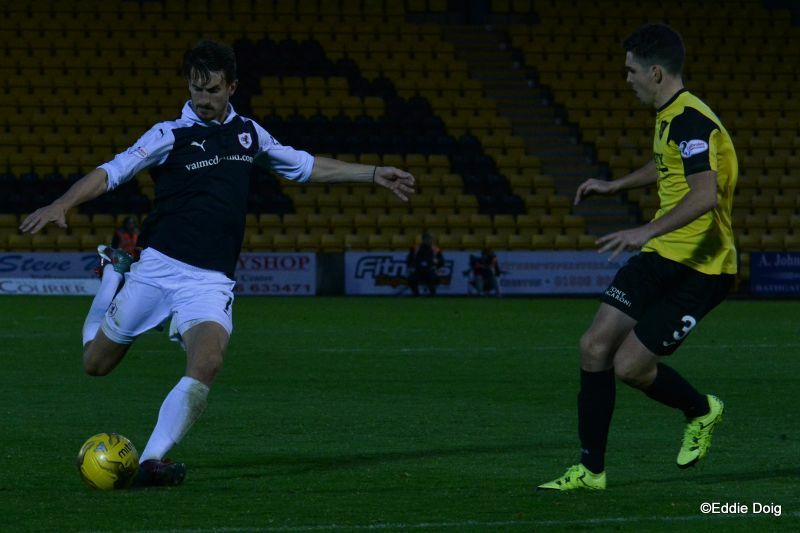 Before the Rovers could respond the hosts helped themselves to a second second half helping when a header over the advancing Rovers back line left White with the simple task of beating Cuthbert to make it three nil. 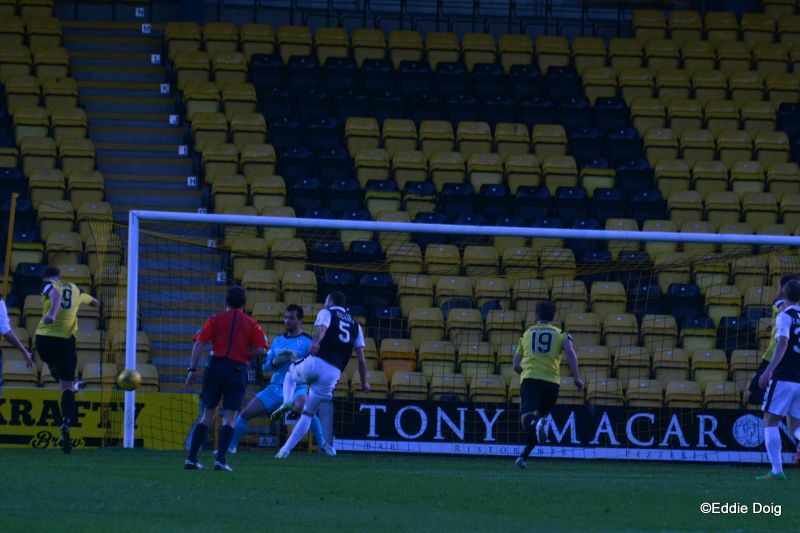 Gallagher was booked then a Rovers corner saw Megginson get on the end of Daly’s flick but his shot was blocked. 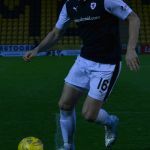 In the 79th minute the Rovers managed to string together a few passes Robertson finding Megginson but Stewart was denied by a desperate challenge six yards out. As the game wound down Cuthbert went for a corner but missed and ended up struggling to get the ball near the edge of the box, thankfully a home man’s effort was blocked. 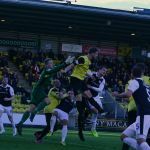 The hosts nearly got a fourth in a stramash before the Rovers broke and the counter attack ended with a feeble shout for handball. A few of the Raith support had by now seen enough deserting the stand to avoid the queue in the car park. 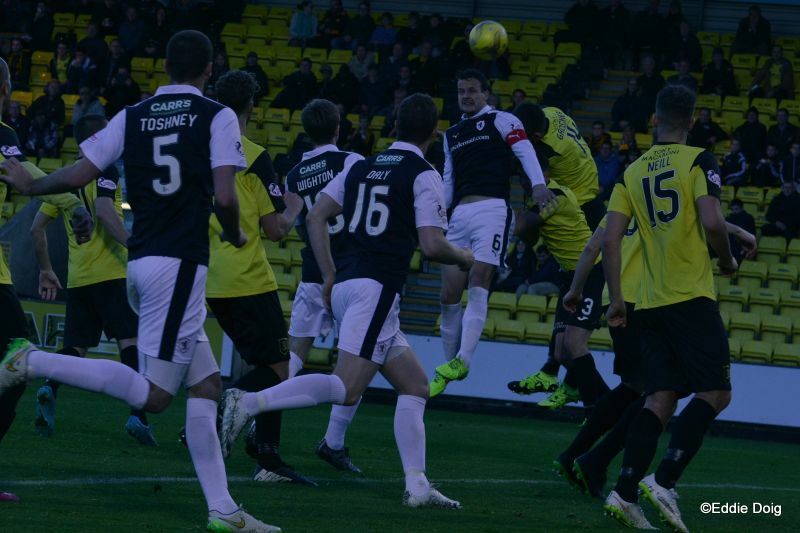 The last few minutes saw Davidson booked and White flash a shot narrowly over. The final incident of note was Hippolyte taking out Toshney without punishment. This was a below par performance and after an early set back the Rovers failed to turn the tables. Following the match Ray McKinnon will have a lot to think about, many would give a penny for his thoughts. Welcome to the Tony Macaroni Arena, the sun is bathing a perfect pitch and it's 16 degrees. 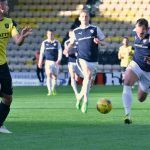 Raith looking to recover from last week's defeat to Hibs, Livingston looking to build on their win over QotS. The sky has just turned black, I hope that the rain stays away. Laurie Ellis seems to have recovered from his injury which he picked up in a recent development game. Longridge brings down Anderson for the first foul of the afternoon. Buchannan shoots wide from 25 yards. Robertson released McKeowan whose pass to Stewart ran out of pitch. 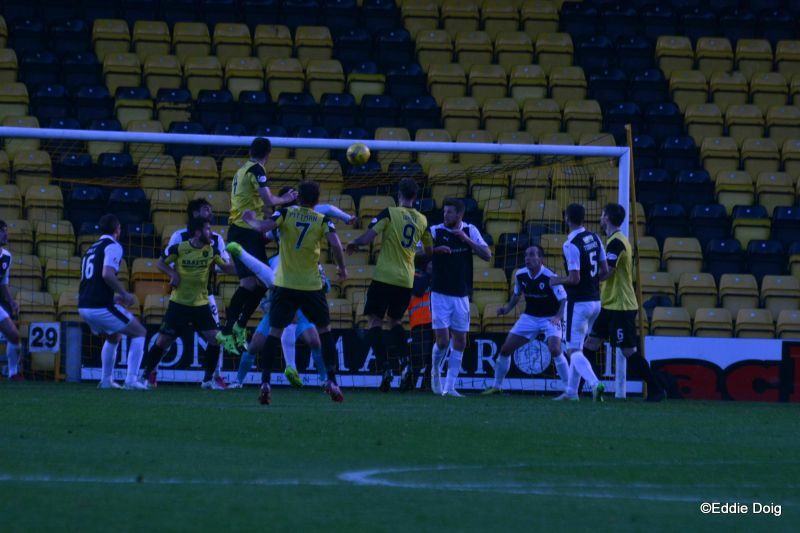 White pressured Cuthbert in a challenge, his header couldn't be cleared off the line by McKeowan. 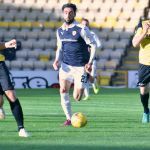 Rovers pushing up the park looking to restore parity. McKeown intercepted a White cross to Buchannan for a corner, Cuthbert gathers and clears. Davo and McKeowan combine on the left, throw Rovers. Mr Allan has a word with Toshney. The choir in the 300 travelling support making themselves heard. Shouts for a penalty as Gordon bundled Daly on the box. 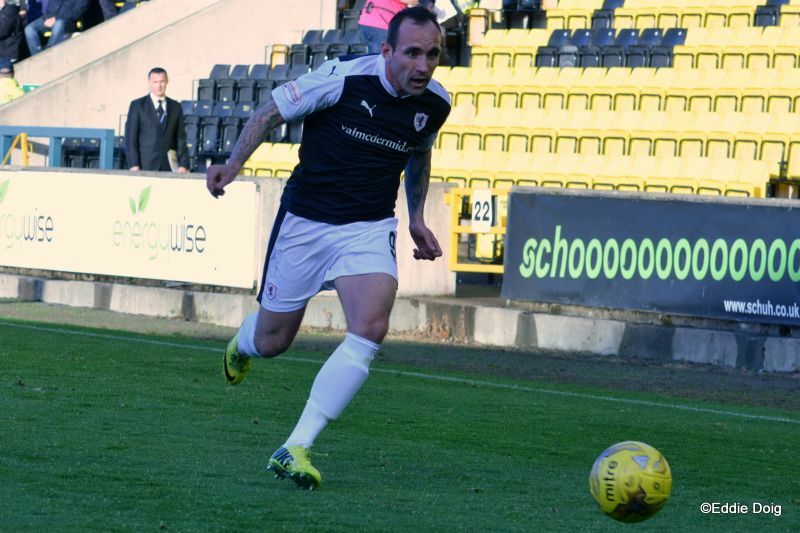 McCord rattled the rafters in the south stand as he fired over the bar. Both teams having to contend with the swirling wind. 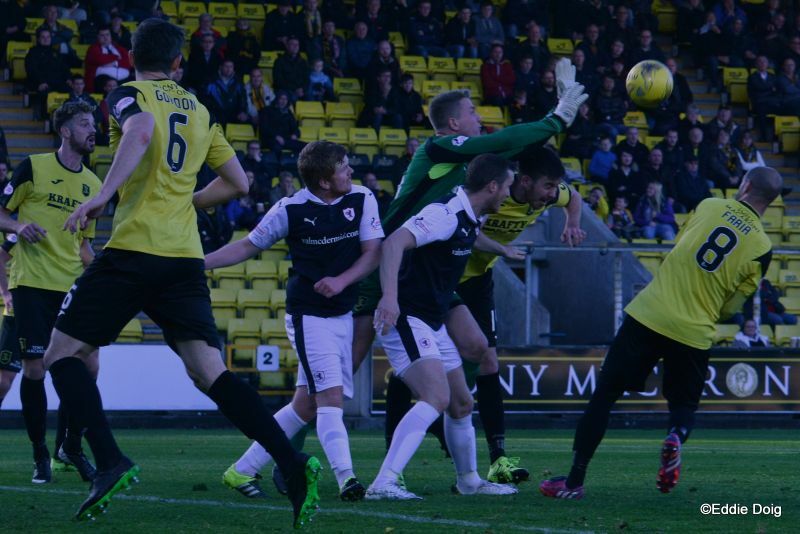 Stewart sees his run ended as he runs into a wall of four Livingston defenders. Neill is matching Daly for every high ball so far. Rovers clear their lines after two corners on the trot. McCord flights ina free kick, Toshney and Daly have efforts cleared. 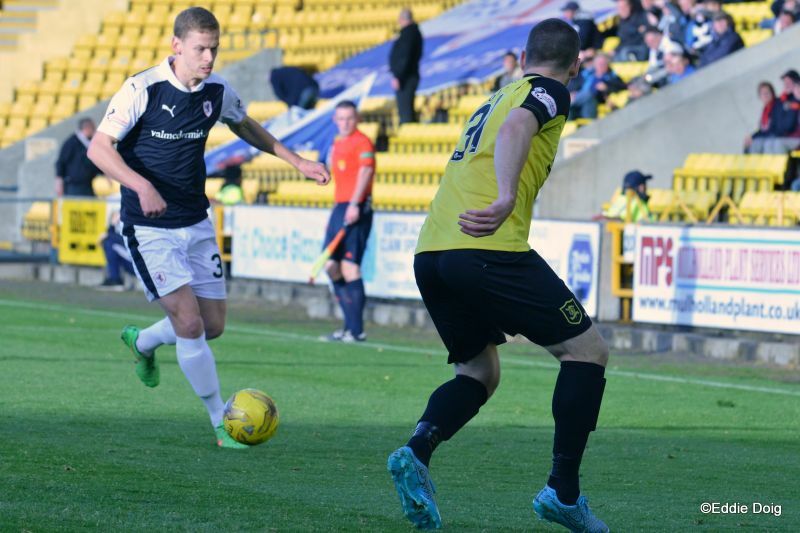 McCord crosses to Thomson, Daly heads across goal and McCord misses at the back post. 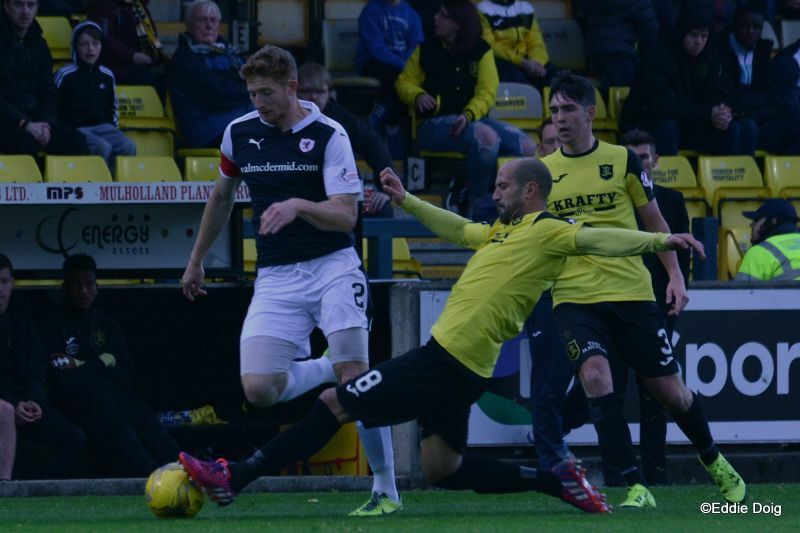 McCallum received preferential treatment from the ref as he went down trying to punch clear. Wi Fi here is awful. McKeown with a long throw but it is missed by everyone. Another trow from McKeowan, this time Daly is denied by the legs of a diving defender. Mr Allan getting the second half underway. 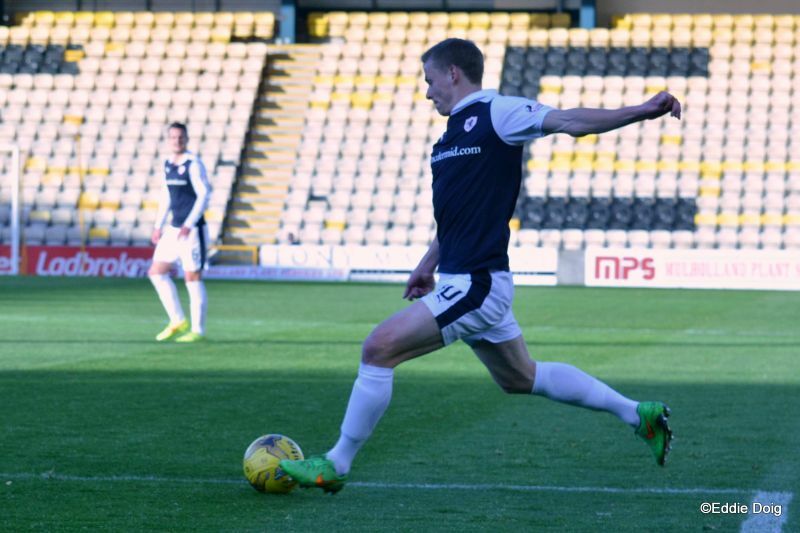 Wighton with an overhead kick, McCord is denied by MacCallum. Benedictus heads over from a free kick from McCord. Cuthbert takes on White and wins,the attacker ended up on his bottom. Stewart through in the box, but the keeper is first to the ball. Anderson 's cross troubled the keeper at the postage stamp corner as the wind took it in flight. Pittman fires wide from 25 yards. 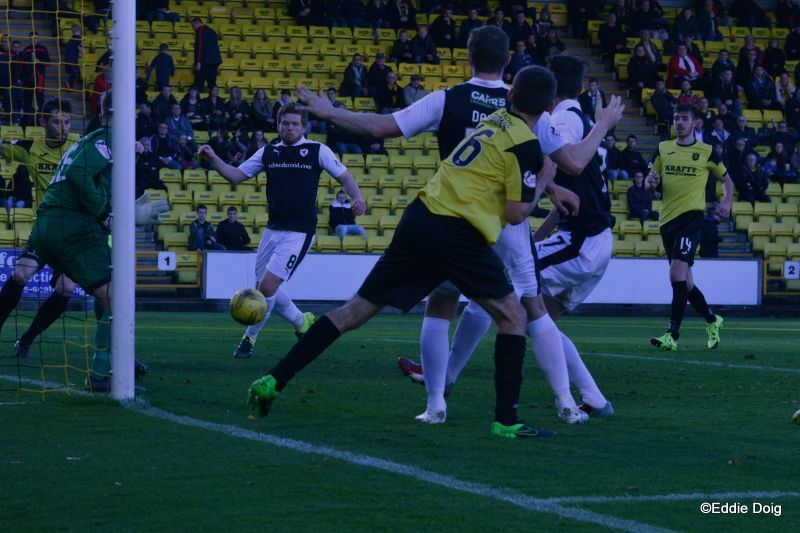 Stewart toe pokes the ball over from just inside the box. Anderson to the rescue with a back post header. Buchannan dispossessed with ease by Toshney. 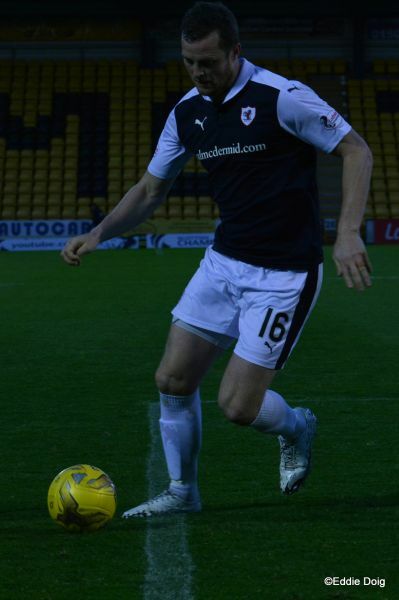 Making his 50th Appearance, Gallagher leapt highest and headed home from 5 yards. Unmarked at the back post, White fires the ball under the diving Cuthbert from 8 yards. 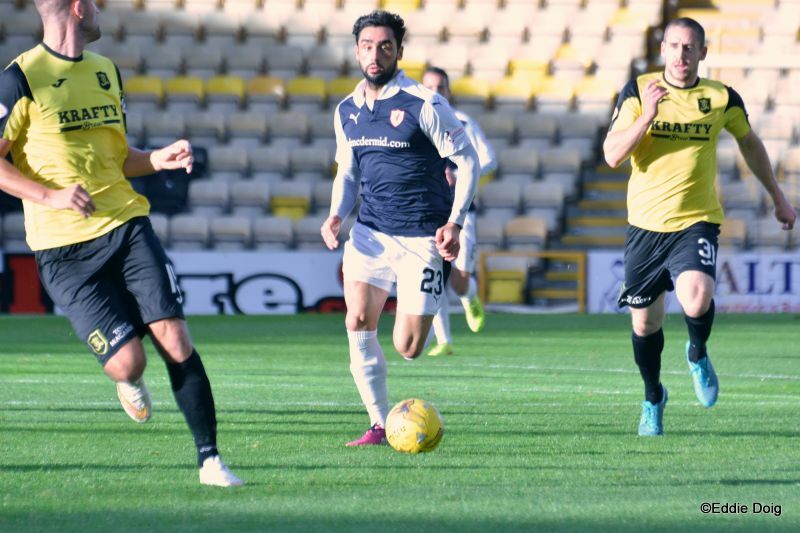 Raith started the half brightly but have fallen behind badly. Gallagher yellow for a trip from behind. 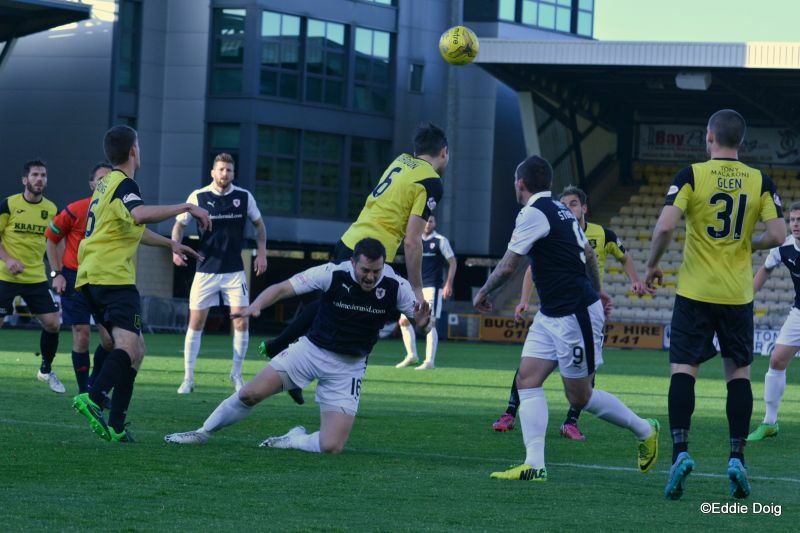 Livingston corner, the ball will have to pay £15 to get back in. Anderson takes on Hippolyte and clears up the park. 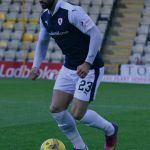 Glen and Gibbons off, Sheerin and Currie on. Toshney yellow for a trip. Cuthbert comes out to clear, spills the ball twice but finally gets the ball away. Gallagher in a heap in the box. Stout defending from Anderson in his new role. 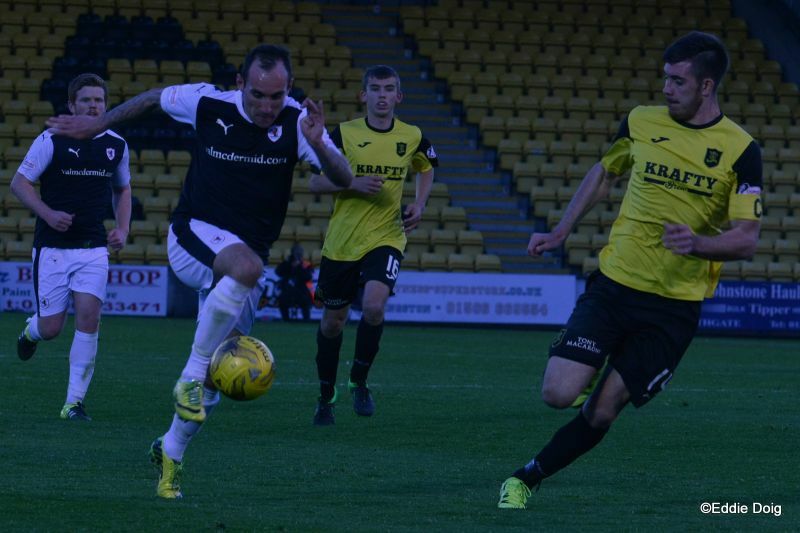 White denied his hat trick by robust defending. Some of the visiting support deciding to leave early. 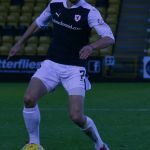 Livingston content with soaking up the Rovers attack. 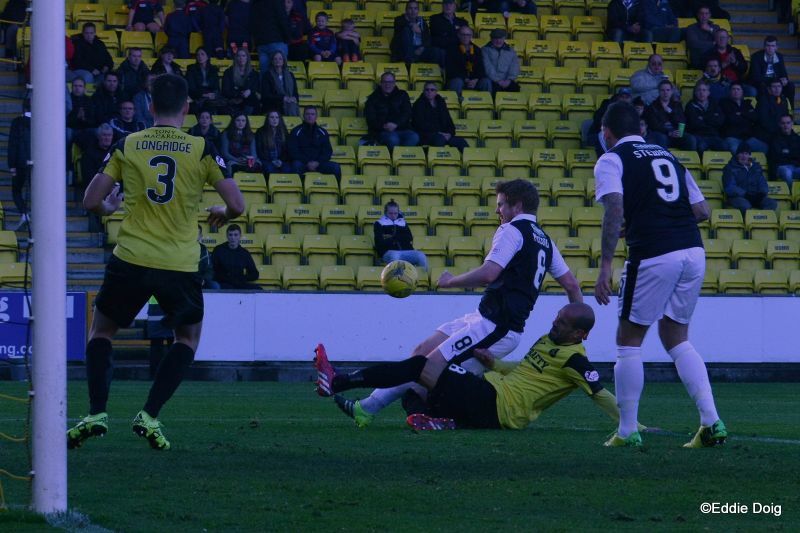 Davidson yellow for a hefty challenge on Hippolyte. McCallum, Longridge, Gordon, Pittman, Faria, White, Gallagher, Neill, Gibbons, Buchannan, Glen. Subs, Jamieson, Millan, Hippolyte, Georgiev, Sheerin, Currie. Cuthbert, Thomson, Toshney, Benedictus, Anderson, McCord, Stewart, Davidson, Daly, McKeowan, Robertson. Subs, Laidlaw, Petrie, Callachan, Megginson, Matthews, Wighton, Craigen. 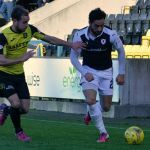 After losing their 100% home record last weekend, Raith Rovers will be looking to bounce back with a trip to the Tony Macaroni arena this Saturday, to face an improving Livingston side. 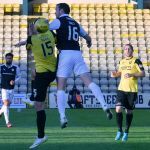 Two close 1-0 defeats to St. Mirren and Rangers were followed up with an exceptional win on Saturday, when Mark Burchill’s men inflicted a 4-1 defeat on Queen of the South at Palmerston Park. 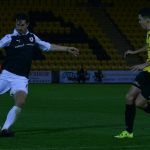 The Livi Lions went in at the interval a goal down, but Scott Pittman equalised five minutes into the second-half, before Jordan White put the Amber Machine 2-1 up. 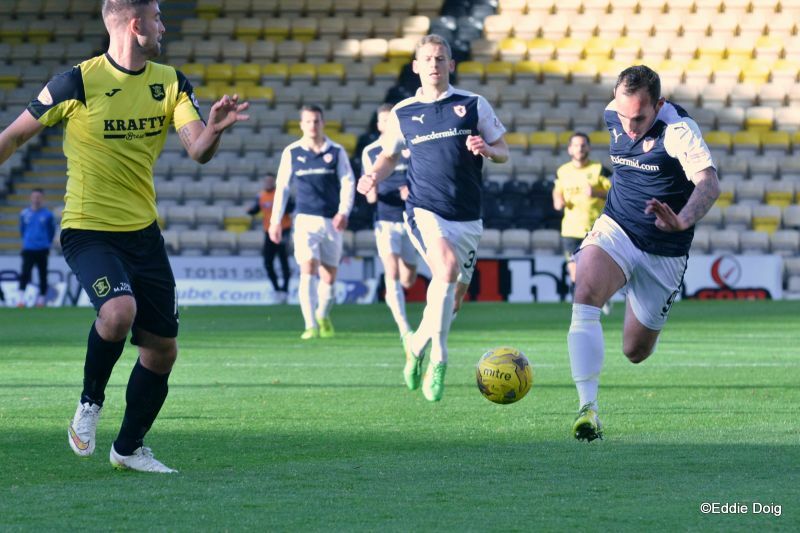 A double from Liam Buchanan completed the scoring. 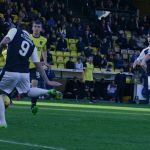 The win lifted Livingston above Alloa Athletic in the table, and with just three points now separating themselves and eighth place Dumbarton, a win on Saturday could lift the West Lothian side out of the relegation play-off position. 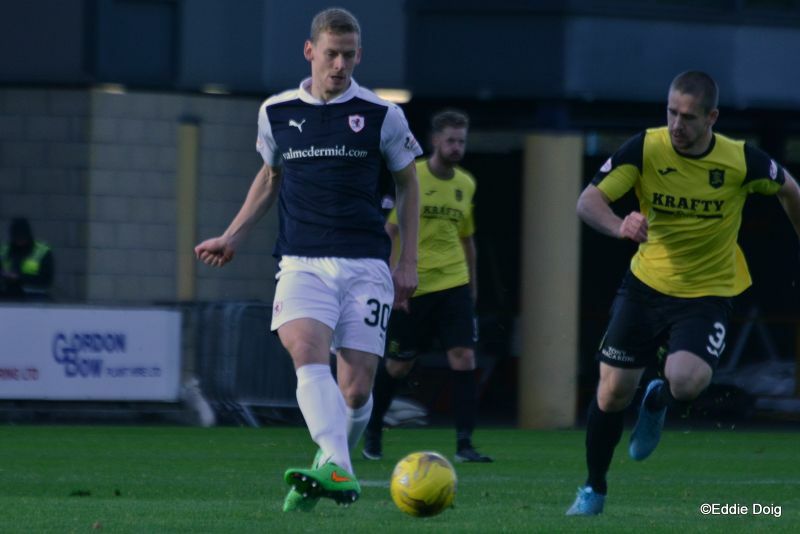 The last meeting between the two teams was in August, when goals from Mark Stewart, Ryan McCord and Mitch Megginson saw Raith win by three goals to nil. 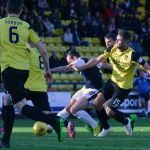 Interestingly, if Rovers win this Saturday, it’ll be the first time they’ve ever won two consecutive league matches against Livingston. 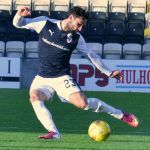 The evidence would suggest that there will be a winner one-way-or-another this Saturday, as this fixture produces very few draws, with just one match finishing all-square from their last 16 meetings, a 0-0 draw back in August 2012. 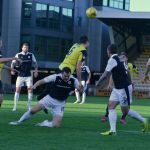 It wasn’t too long ago that Livingston appeared to have something of a hex over Raith, but there’s now nothing between the two sides in the most recent head-to-head record, with five wins apiece from the last ten meetings. 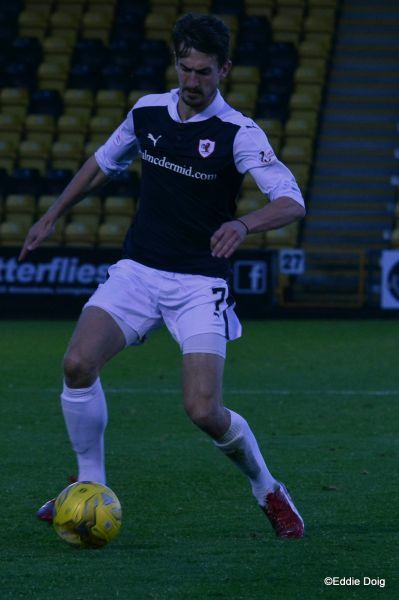 Saturday’s match referee will be Crawford Allan.